participate in the peace process. provide the truth that everyone is due. situation today the same blueprints of yesterday. vision that has no sense any more and has generated unbearable situations. of peace, take the risk of life. 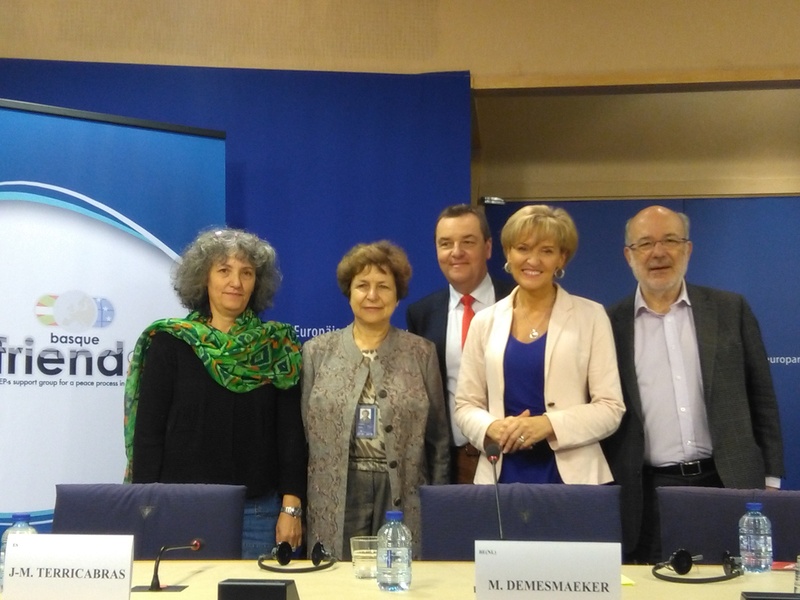 The Basque Friendship Group organizes the event “Disarmament Process: Towards a lasting peace in the Basque Country” which will be held on 5th September at the European Parliament. Mr. Harold GOOD. Eminent Irish Methodist who played a vital role in the North of Ireland peace process, along with Father Alec Reid who oversaw the decommissioning of arms. He was also member of the disarmament commission of ETA organisation held last April. He will explain the details of the process. Mrs. Anaiz FUNOSAS. Spokesperson of “Bake Bidea”, civil society organisation from the north of the Basque Country, which works in favour of the Basque Peace process. She will stress the pending issues ahead, such as the situation of the Basque politically motivated prisoners. Basque Friendship taldeak antolatuta, “Desarme prozesua: Bakre iraunkorraren bidean Euskal Herrian” ekimena izango da datorren irailaren 5ean Europako Parlamentuan. Harold GOOD. Irlanda Iparraldeko apaiz metodista eta ezinbesteko papera izan zuena bertako bake prozesuan, Alec Reid apaiz katolikoarekin batera armen dekomisioa begiztatu zuena. Halaber, pasa den apirilean ETA erakundearen armagabetzea ikuskatu zuen batzordeko kide izan zen. Prozesuaren xehetasunak azalduko ditu. Anaiz FUNOSAS. “Bake Bidea”-ko bozeramailea, Ipar Euskal Herriko gizarte zibileko erakundea, euskal bake prozesuaren alde lanean ari dena. Hizpide izango ditu armagabetzearen ondoren jorratzeke geratzen diren gaiak, bereziki, motibazio politikoko euskal presoen egoera. 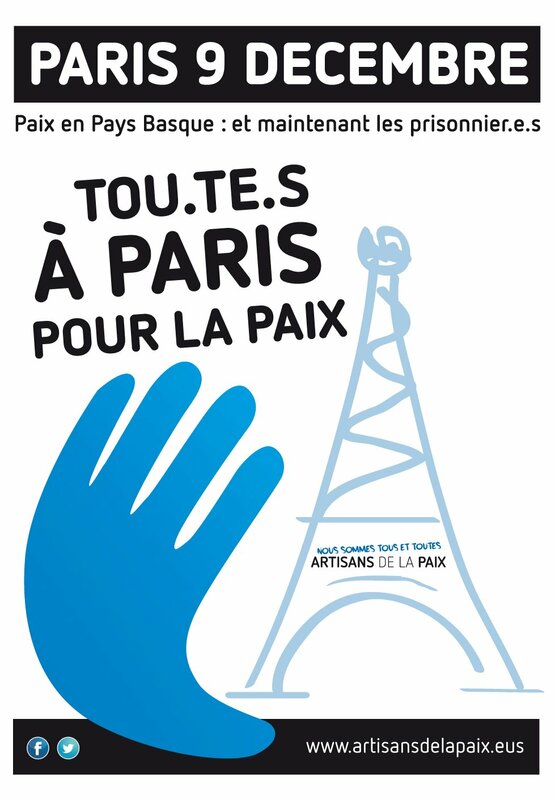 El grupo Basque Friendship organiza el evento “Proces de desarme: Hacia una paz duradera en el País Vasco”, el cual se celebrará el próximo día 5 de septiembre en el Parlamento Europeo. Harold GOOD. Pastor metodista irlandés, quien jugó un papel vital en el proceso de paz del Norte de Irlanda, junto con el cura católico Alec Reid, quienes supervisaron la decomisión de armas en Irlanda. Fue miembro también de la comisión de desarme llevado a cabo por ETA el pasado mes de abril. Dará cuenta de los detalles del proceso. Anaiz FUNOSAS. Portavoz de “Bake Bidea”, organización de la sociedad civil del norte del País Vasco, que trabaja en favor del proceso de paz vasco. Durante su intervención, hará especial hincapié en los temas pendientes que quedan después del desarme, como por ejemplo en la situación de los presos vasco de motivación política. The Basque Friendship Group welcomes the announcement made public last week on the process of disarmament of ETA, foreseen by 8th April, in a press conference held in Brussels, where Irish MEP Martina Anderson, Flemish MEP Mark Demesmaeker, Galician MEP Lidia Senra and Catalan MEP Josep-Maria Terricabras took part. Sinn Féin MEP Martina Anderson stated: “We welcome the recent news from Basque civil society groups involved in developing a process of disarmament in the Basque Country that ETA has entrusted civil society with the responsibility of overseeing its arsenal’s disarmament, and that on the afternoon of the 8th April, ETA will be fully disarmed”. Anderson also said that “this news has been accepted as genuine by main stakeholders in the Basque Country and Basque Institutions, both north and south, and civil society has shown its support for the process, which would include international verification to ensure that weapons are put beyond use”. 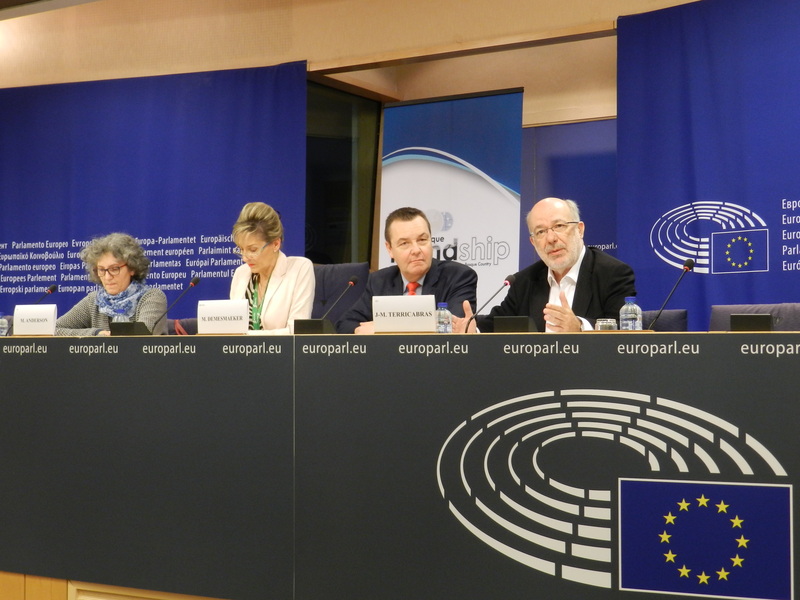 “The main stakeholders in the Basque Country – the Sinn Féin MEP added – Basque Autonomous Government, Autonomous Government of Navarre and most of the political parties and social organisations have recognised the importance of this initiative and shown their support. This process involves leadership of Basque civil society, international verification and support of Basque institutions and parties”. As a member of the Basque Friendship Group, Anderson considered “the announcement to be very good news, building on the statement made in 2011, two days after the Aiete peace conference, that ended the armed campaign. This new step shows the commitment of Basque pro-independence forces and Basque civil society and we want to recognise the work that has gone into making this possible”. The N-VA Flemish MEP Mark Demesmaeker stated: “We sincerely hope that Spanish Government and French Government will grasp this opportunity and not derail it, as in previous occasions. 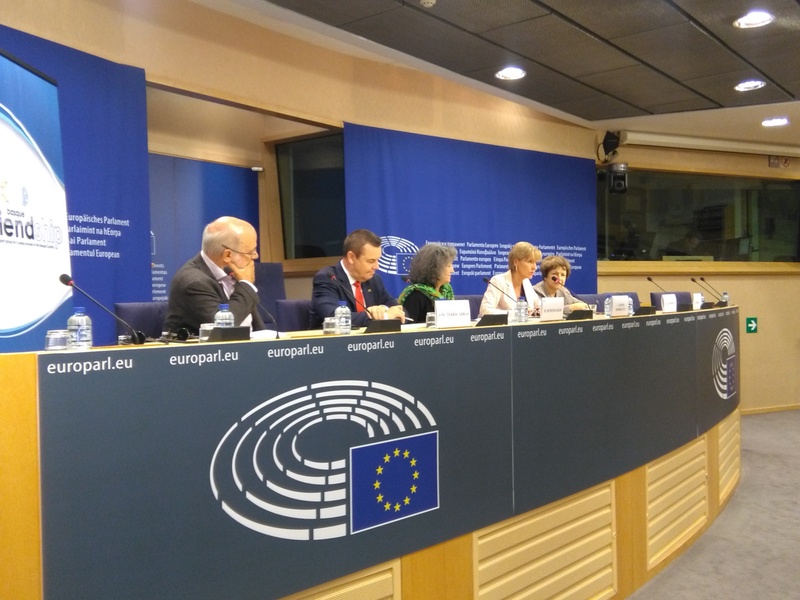 This new process has the support of majority of Basque society and institutions, and we therefore request the Spanish Government, and appeal especially to French Government – since where most arms dumps are supposed to be – to allow the disarmament process to take place. Demesmaeker also underlined that “this announcement is also good news for EU security, peace and democracy, and we therefore call upon the institutions of the European Union to support this process in whatever way possible”. With that purpose, the Flemish MEP announced that “we have requested a formal meeting with the French Ambassador and Permanent Representative in the EU, Mr. Nicolas Suran, and with the Spanish Ambassador and Permanent Representative in the EU, Mr. Pablo García-Berdoy, in order to make known our position on the disarmament process and its importance, and to express our commitment to support any such disarmament process to its completion, as a vital step towards a complete and lasting peace in the Basque Country”. 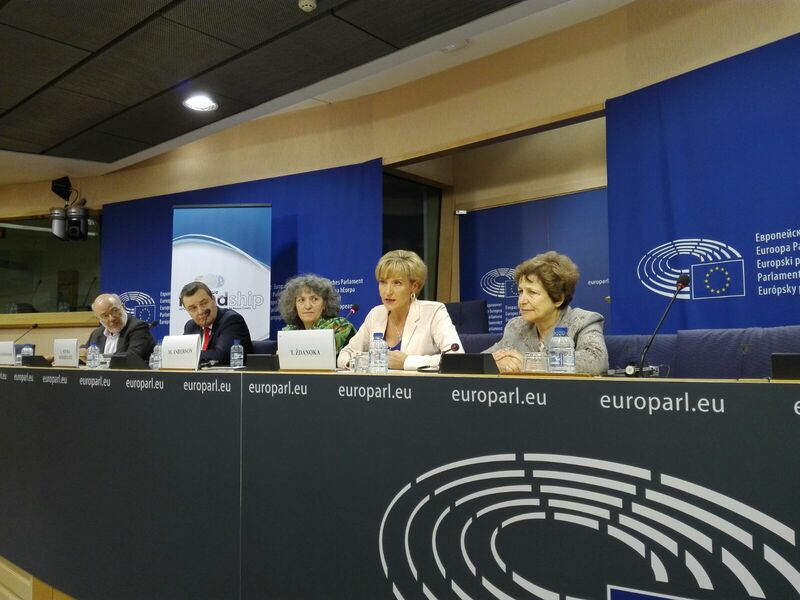 The Friendship Group wishes to recall, on a press conference held at European Parliament on 19th October, the resolution approved on 23th October 2006 by the European chamber, which shows its support to the Basque peace process and solidarity with all actors involved in its resolution. Furthemore, the members of the Basque Friendship Group wants to recall that the resolution is still in force and ask to European institutions to keep working for it to be implementedand urge political parties in spanish state to include the resolution of the conflict in the Basque Country in the agenda of the new spanish government, expected to be formed soon. Basque Friendship taldeak gogora ekarri du 2006ko urriaren 23an Europako Parlamentuak onartutako erresoluzioa. Bruselako egoitzan asteazken honetan egin den prentsaurrekoan azaldu moduan, europar diputatu taldeak adierazi du ebazpen hark Euskal Herrian zabaldutako bake prozesuari babes osoa adierazten zion, konponbidean inplikatutako aktoreei babesa adieraztearekin batera. Halaber, Basque Friendship taldeak gogorarazi du erresoluzioa indarrean dela eta eskatu die Europako erakundeei orain hamar urte onartutako ebazpena inplementatu dezatela. Horrekin batera, estatu espainiarreko alderdiei dei egiten die euskal gatazkaren konponbidea gobernu espainiar berriaren agendan txerta dezaten. El Grupo de Amistad Vaco (Basque Friendship Group), en una conferencia de prensa celebrada miércoles 19 de octubre en el Parlamento Europeo, ha recordado la resolución aprobada el 23 de octubre de 2006 por la cámara europea. En aquella resolución, el Parlamento Europeo mostraba su apoyo al proceso de paz en el País Vasco y la solidaridad con todos los agentes implicados en su resolución. Asimismo, los miembros del Grupo de Amistad Vasco quiere recordar que la resolución sigue todavía en vigor y pedir a las instituciones europeas para que sigan trabajando para que sea implementada, e instar a los partidos políticos en el estado español para que incluyan la resolución del conflicto en el País Vasco en la agenda del nuevo gobierno español. 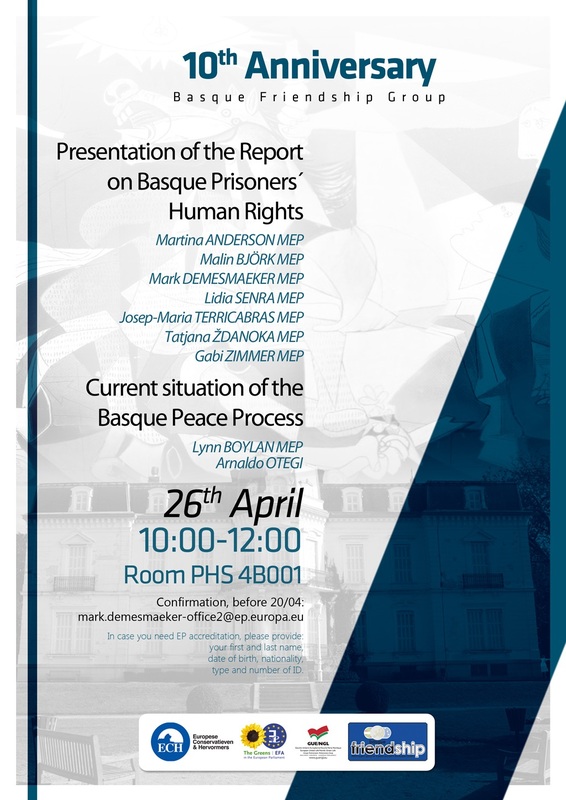 The Basque Friendship Group will host the presentation of a report on Basque Prisoners’ Human Rights, written by a delegation of 7 MEPs from three different groups who visited the Basque Country in February. 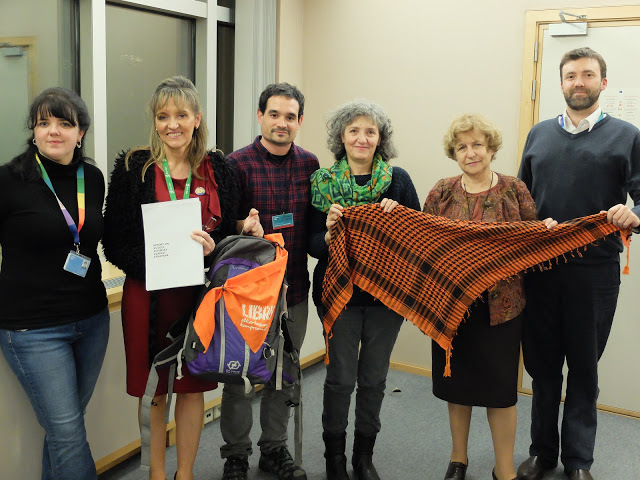 During their visit the MEPs met different civil society organisation, political parties, institutions and authorities in the Basque Autonomous Community and the Foral Community of Navarre. The delegation will present a report on prisoners’ Human Rights, taking into account the information they received during their visit. The Basque Friendship Group has invited Mr. Arnaldo Otegi, ex spokesperson of Batasuna and now Secretary General of the political party Sortu, whom has recently been released from prison for trying to rebuild an outlawed party that was considered ETA’s political arm. The Basque Friendship group hosted in March 2015 the presentation of the Free Otegi International Declaration endorsed by 24 International figures. Arnaldo Otegi, whom Nobel Peace Prize Laureate Desmond Tutu called “the leader of the peace process”, will talk on the current situation of the Basque Peace Process. Basque Friendship taldeak antolatutako ekimen honetan, hiru talde parlamentariotako zazpi europar diputatuk idatzitako txostena aurkeztuko da, Otsailean Euskal Herrira egindako bisitan oinarrituta. Bidaiak iraun zuen hiru egunetan Hego Euskal Herriko gizarte zibileko elkarterekin, alderdi politikoekin eta erakunde publiko zein agintariekin elkartu ziren. Delegazioak Euskal Presoen Eskubideen inguruko Txostena aurkeztuko du, Euskal Herrira egin zuten bisitan jaso zuten informazioa oinarri hartuta. Basque Friendship taldeak Arnaldo Otegi jauna gonbidatu du, Batasunako bozeramaile ohia eta egun Sortuko idazkari nagusi dena. Orain gutxi kartzelatik atera da ETAren agindupean legez kanpoko alderdi bat eratzen saiatzea egotzita. Basque Friendship taldeak 2015eko martxoan “Free Otegi International Declaration” ekimena aurkeztu zuen, nazioarteko 24 pertsona ezagunek izenpetu zutena. Desmond Tutu Bake Nobel Saridunak “Bake prozesuaren lidertzat” jo zuen Arnaldo Otegi, eta Euskal Herriko Bake Prozesuak gaur egun bizi duen egoeraren inguruan hitz egingo du. El Grupo Basque Friendship acogerá la presentación del informe elaborado por siete diputados europeos de tres diferentes grupos parlamentarios que visitaron Euskal Herria el pasado mes de febrero. Durante su visita, las y los diputados europeos se reunieron con diferentes organizaciones de la sociedad civil, partidos políticos, instituciones y autoridades de la Comunidad Autónoma Vasca y la Comunidad Foral de Navarra. La delegación presentará el informce sobre los Derechos Humanos de los presos y presas vascas, basándose en la información recabada durante su visita. El Grupo Basque Friendship Group invita al Sr. Arnaldo Otegi, ex portavoz de Batasuna y en la actualidad Secretario General del partído político Sortu, quien recientemente ha sido excarcelado bajo la acusación de reconstruir un partido ilegalizado bajo las directrices de ETA. El Basque Friendship presentó en Marzo del 2015 la declaración internacional “Free Otegi” que fue suscrita por 24 personalidades internacionales. Arnaldo Otegi, a quien el Premio Nobel de la Paz Desmond Tutu llamó “el líder del Proceso de Paz”, hablará sobre la situación actual del proceso de paz en Euskal Herria. 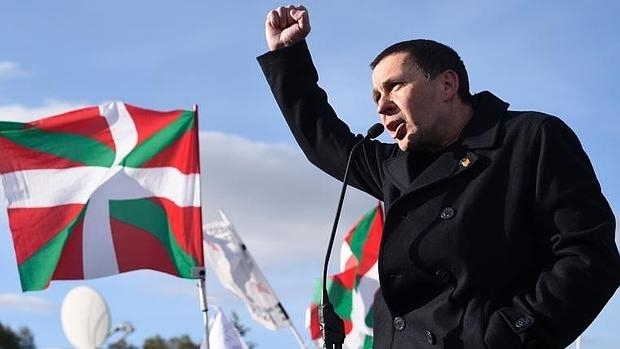 The Basque Friendship Group, which promotes the resolution of the conflict in the Basque Country, considers that Arnaldo Otegi should not be arrested as his contribution to the new scenario was crucial. Furthermore, considers completely unfair and arbitrary that he has been deprived of freedom for six years. It contemplates that Mr. Otegi´s contribution might be helpful for the peace process in the Basque Country to go forward and overcome the current blockade maintained by Spanish and French governments. Friendship Group considers these prosecutions contrary to the core values of the European Union and a serious breach of civil and political rights. Also believes that maintaining these policies at a time when the doors for the resolution of the conflict are fully open does not help to create positive conditions for the development of process. The court case against Civil Society association Askapena ended 2nd of November this year and we are waiting now the decision of the Court. Five of its members risk going to prison up to six years accused of promoting political and peaceful activities. Askapena, an association promoting international solidarity that has legally existed for more than 29 years risks being banned.